The celebrity billionaire has recently made several trips to Russia and looks to expand his empire with projects in the country, but remains tight-lipped on his plans. Billionaire Richard Branson has been giving no rest to Eastern Europe for the second month in a row now. In September he visited the economic forum in Yalta (Ukraine), and this month his visits to Russia have become more frequent too. He has already made a speech at the ‘The Money of the Future’ conference and soon he will arrive in Russia to take part in the ‘Open Innovations’ forum. 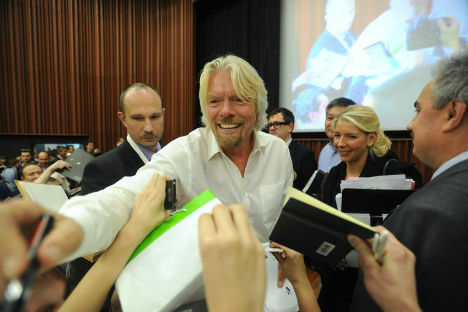 Branson appears everywhere with a smile, gives autographs and receives his share of people’s love. He says nothing about real projects though, which is a great disappointment for both businessmen and experts. Branson’s fortune is not as impressive as that of other billionaires – 4.2 billion dollars. Even in Britain, which is his home country, he ranks third on the wealthy people list. Richard Branson became known all over the world due to his unbridled temperament and eagerness to test himself in various fields. The empire of Richard Branson - Virgin Group – includes more than 300 various companies. He has a mobile phone operator company, an air carrier, a railway company, and even an agency involved in space tourism. Approximately 6 months ago Branson said that he would like to work in Russia. And experts have been guessing all this time where he plans to start his business and what he plans to put at risk this time. They hope that the intrigue will be solved in a few coming days – probably, at the Open Innovations forum. At the moment experts have two suppositions regarding the interests of the Virgin Group in Russia. Air transportation in the first place! Earlier, according to an inter-governmental agreement two companies – British Airways and BMI – worked on the Russia-Britain track. But later the first absorbed the second, and the place on the market became vacant. Branson immediately said that Virgin would carry passengers from Moscow to London and back with pleasure. However, what matters here is the decision of the British authorities, not on the billionaire’s wishes, and the British Government has at least one more application to consider besides that of the Virgin Group. For the time being, all Branson’s appearances in Russia seem to be no more than an advertising campaign. The British billionaire meets with representatives of the Russian business, gives autographs and is tells them the history of his business. He says that the distinctive feature of his Virgin Group is that it consists of various units. And as regards experts and businessmen, they would like to receive more concrete information. And if Branson fails to gain an access to Russia’s market, this will become a great disappointment for them. Words are no good here because the market needs interesting investments.